Every love has a story to tell. We make it easy to tell yours. 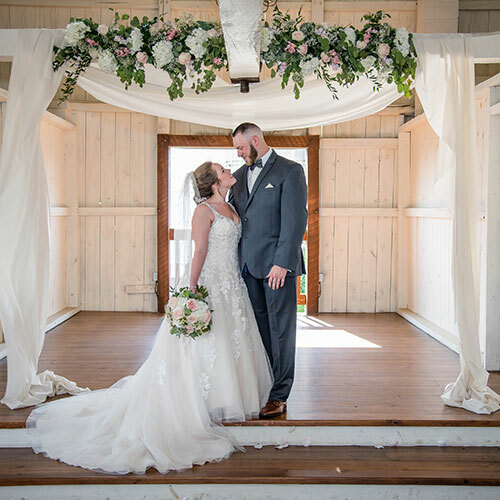 As family and friends gather at Stoltzfus Homestead and Gardens to celebrate your wedding day, the things they feel and experience will tell a story of you. The gorgeous gardens speak of simple joys and natural wonder while the relaxed elegance of our two historic barns whispers a reminder of quiet strength and timeless beauty. As the sun sets, laughter and easy conversation fill the air. The sparkle of lights and the glow of an evening fire fill the night sky and bring a close to a perfect wedding day, overflowing with memories to cherish for a lifetime. It’s your love story. Tell it well. Our wedding packages are simple and straightforward! We want you to know exactly what you are getting without feeling confused or overwhelmed. Stoltzfus Homestead and Gardens is a venue like non other. With a historically preserved Grand Barn and Tobacco Barn, outdoor lounge and courtyard, guests won’t want to leave and neither will you! Our onsite services help bring your vision to life and our partner vendors make wedding planning a breeze. There are no words to express how happy I am that my husband and I chose Stoltzfus Homestead & Gardens as our wedding venue. From the very first look, Dawn & Brian were a dream to work with. They were always personable, professional and prompt. Our day-of coordinator Pam was also fantastic. You can tell that everyone at Stoltzfus gives their hearts & souls to every wedding. I was told by many of my guests that my wedding was the most unique and most fun wedding they had ever been to. The buildings and grounds are gorgeous and kept so well. Everywhere you look there is something more beautiful and more awesome than the last. We were also given a list of recommended vendors who work frequently with Stoltzfus and I would highly recommend going with any of them. All in all, we had a fantastic time and would select this as our venue again in a heartbeat. 10/10! Thank you! !